A Not for Profit plan around information technology (IT) can save money in the long run and help an organisation better deliver services, writes Infoxchange technical writer Jane Rawson, who offers her advice on how to develop an IT plan. You know your IT isn’t doing all you want it to, but you don’t know why or how to fix it. You’ve heard there are some great applications “in the Cloud” but you’re not sure how to find them or even what that means. You wish that your organisation’s technology set-up ran better, but you’re worried fixing it will cost too much. You probably need an IT plan. You’re not alone: more than 66 per cent of Not for Profits haven’t planned their IT. Making a plan for your organisation’s information technology can save you money in the long run. It can help your organisation run more smoothly and deliver better services. And you’re likely to get a better result than you would buying hardware or installing apps on an ad-hoc basis. But before you start on your journey, figure out where you are now and how you want your organisation to look once you’re done. You might be pleasantly surprised by how little effort it will take to set you off in the right direction once you know your start and end points. And remember: not every organisation has to have all the latest IT. A better result is having the IT you need to carry out your mission. On ImproveIT, which helps community and health organisations – particularly smaller organisations with fewer than 40 “seats” and little internal technical support, we’ve developed a quiz which can help you figure out how well your organisation has got to grips with technology. risk management and disaster recovery. The quiz takes half an hour or so. If you’re ready, open the quiz in Excel (or download a printable version here). Answer the questions in each section honestly – remember, not every organisation has to be great at every area of IT. When you’re done tally up the ticks for each in the totals area at the end of each section – don’t count the places where you’ve answered not applicable. If all or almost all your answers were ‘Disagree / don’t know’, then your proficiency for that section is Basic. If all or almost all your answers were ‘Somewhat agree’, then your proficiency for that section is Intermediate. If all or almost all your answers were ‘Mostly agree’, your proficiency for that section is Proficient. If all or almost all your answers were ‘Completely agree’, then your proficiency for that section is Transformative. 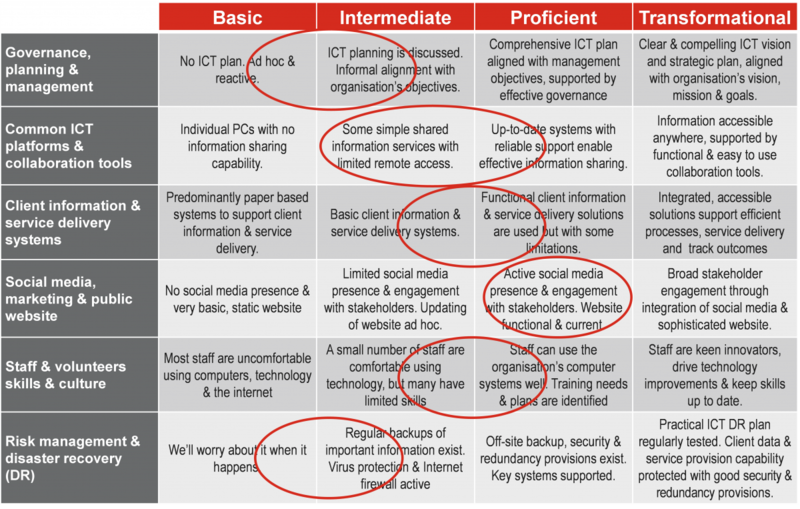 It can be valuable to show where you are pictorially, so grab a copy of the Digital Proficiency Matrix (for Australia or for New Zealand) and circle the sections you’re in. Information technology is not an exact science so you may fall entirely into one proficiency level, or somewhere in between. This should give you a good idea of your strengths and weaknesses. Now you know where you’re at, how do you plan to get where you want to go? the projects or actions you plan to resource over the next year or two to improve your IT – go into detail. Review your draft plan with a critical eye. Is it realistic (or are you trying to achieve too much)? Is it justified (are the benefits that you’ll receive from the actions enough to justify the cost and effort)? Once you’re happy with it, get formal buy-in and approval (remember, it is best to test ideas as you go through the process – don’t surprise your manager, CEO or board with significant new ideas, plans or requests for funding). Make sure you align any requests with the appropriate schedule (for example, if your financial year is July – June, you might need to have the draft plan finalised in April or May for inclusion in next year’s budget). We recommend your Board of Management discusses the IT plan so that Directors/Trustees are engaged in the discussion about IT and that you benefit from their experience. Infoxchange has written a digital business kit, which takes you through every step of the IT planning process – if you feel like your organisation is ready to make a plan, read it here. 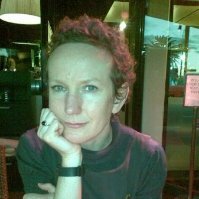 About the Author: Jane Rawson is a technical writer at Infoxchange. Infoxchange is a Not for Profit community organisation that delivers technology for social justice.